Malaysia-based salad grower, Genting Garden, call upon Hanwell Solutions monitoring technology to assist with ensuring quality produce. Malaysia is well-known for its tropical rainforest climate. With warm temperatures from 22°C to 35°C and high relative humidity being around 80%, the countries salad production can only take place up within the mountains. Salad grower and distributor, Genting Gardens, are based in the Genting Highland located approximately 45 minutes’ drive from Kuala Lumpur and is around 4000 feet above sea level. 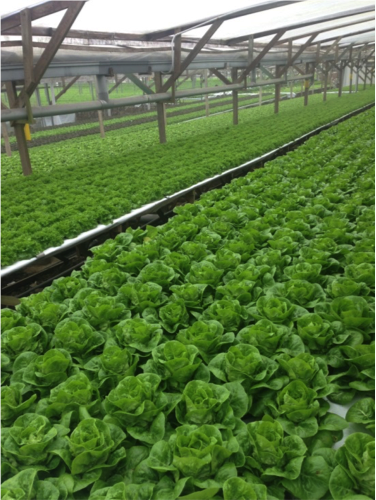 Genting Gardens’ location provides a more consistent climate for salad production as the air is cooler in the mountains and prevents the salad from becoming affected by the potential damage caused by heat. Temperature monitoring in these conditions is clearly a must, but where this case becomes even more challenging is in its distribution. Genting Gardens’ fresh salad produce has to be transported far and wide, by road in trucks, off to shops and high-end restaurants. Sometimes vehicles are gone from base for several days, experiencing a very wide variety of potentially damaging conditions. Losing the load to temperature fluctuations was a very real problem. To assist with their difficult challenge, Genting Garden chose Hanwell through their Malaysian distributor, Cynotex, for their temperature and expertise. The salad production and distribution company use multi-purpose trucks as they have the flexibility to deliver a wide range of produce without returning to base. The temperature in the trucks is set around 4°C. Initially, as a trial one truck was installed with a Hanwell iSense to monitor the temperature. The iSense GPRS transmitter is an innovative self-contained unit enabling remote monitoring of diverse parameters via wireless GPRS technology, therefore ideal for the trucks in the remote locations they often travel through. The RL1001 temperature transmitters were also trialled in cold rooms (incoming raw materials, processing, ready-to-eat meal and finished products) and production areas. Alarms were set up to wirelessly relay temperature fluctuations back to base and to the driver for immediate action to be taken (if required). After a successful trial, additional Hanwell iSense units were installed in all trucks to monitor the truck temperature and condition throughout the deliveries to customers. Together with the RL1001 data, the Hanwell iSense unit’s transmit data to the same Synergy software which, not only provides real-time monitoring data, but also gives Genting Garden total visibility of their operation through full journey profile information. The system also provides compliance data and alarms should any equipment breakdown. This ultimately assists in reducing the amount of produce lost from temperature damage and has already saved the company a considerable amount of money. The use of Synergy software, Hanwell iSense and radio sensors in their operations shows a commitment to quality and assurance to their customers that they care about how their product is handled, stored and delivered. Temperature monitoring for salad delivery trucks to ensure optimum temperature is maintained throughout journey. Based in the Genting Highlands, a 45 minutes’ drive from Kuala Lumpur, Genting Garden grow and produce fresh salad and herbs. The Hanwell iSense GPRS transmitter used to monitor the temperature in the trucks and salad production area. The RL1001 transmitters used to monitor the temperature in cold rooms. Reduced amount of lost stock.